Neapolitan street food is one of the best and most traditional street food of the whole Italian culture. Unlike other cities, in Naples street food is not an innovation due to accelerated pace of modern life: it is something strongly rooted in the culture of the city. 1700: small houses, not everyone could afford a kitchen at home and the poorest fed with small meals in the streets that were never guaranteed: all of this implied the born of Neapolitan street food. It was already common to eat on the street, reinventing leftover of food such as bread dough. In fact, the Tarallo could be taken as a symbol of Neapolitan street food. It is made of dough, pork fat and pepper and it is still one of the most loved form of street food, for its simplicity and tastiness. Another of the most important Neapolitan street foods is pizza, especially the “wallet” one. It is a pizza smaller that the normal size, folded in a peculiar way – “a portafoglio”, that means “as a wallet”. It can be easily eaten without cutlery and, if you are in a hurry, you can even eat it while walking. Most of the other kinds of Neapolitan street food are fried. 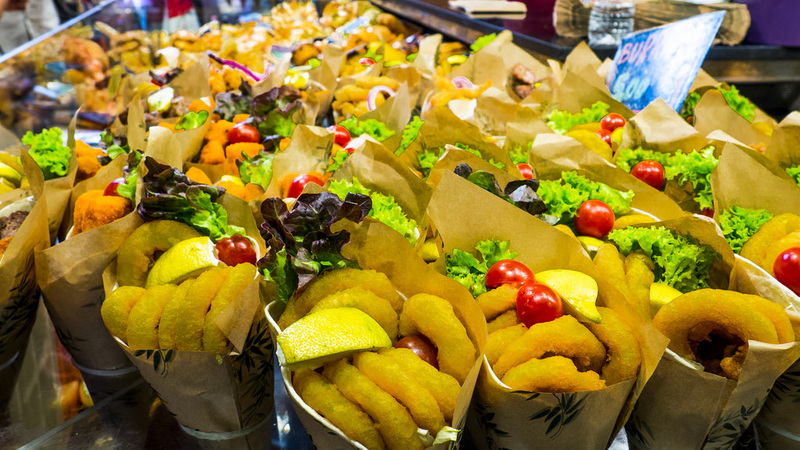 In addition to fried pizza, in Naples are sold also “cuoppi”. The cuoppo is a cone of paper filled with fried food. There are “sea” versions, with shrimps, squids, fishes and seaweed pancakes and “earth” versions with crisps, vegetables and fried mozzarella. Another popular food is the “frittata”. It is not a simple omelette: the real Neapolitan omelette include pasta, peas and meat and is served in round, flattened and easily portable shape. Recently, the “frittata” has become subject of experimentation: even if it is always with egg and pasta, in some street food stores you can taste different recipes, including formulas suitable for vegetarians. Someone experiments also the sweet kinds. “O pere e o musso” (literaly, “the foot and the muzzle”) is another traditional street food of Naples. It is something that you can eat while walking: the tripe of pork and veal boiled and served cold, in small pieces and seasoned with salt and lemon. These foods are truly loved by Neapolitans who do not eat them only as a snack but also as a rich appetizer.